In 2015, Studio Outside completed a master plan for a 130 acre residential property in New Ulm, Texas. Located 75 miles northwest of Houston, the land is situated in an area of transitions. It is in the Southern Post Oak Savanna, a narrow ecoregion that lies between the Southern Blackland Prairie to the west and the Northern Humid Gulf Coastal Prairie to the east. While truly a Post Oak Savanna, the region contains subtle characteristics of both adjoining prairies. Much of the land had been heavily grazed by cattle, and the pre-existing savanna ecologies have been degraded. In 2007, a family from Houston purchased the land with the hopes of restoring life to the prairies and for the land to become a part of the family for future generations. 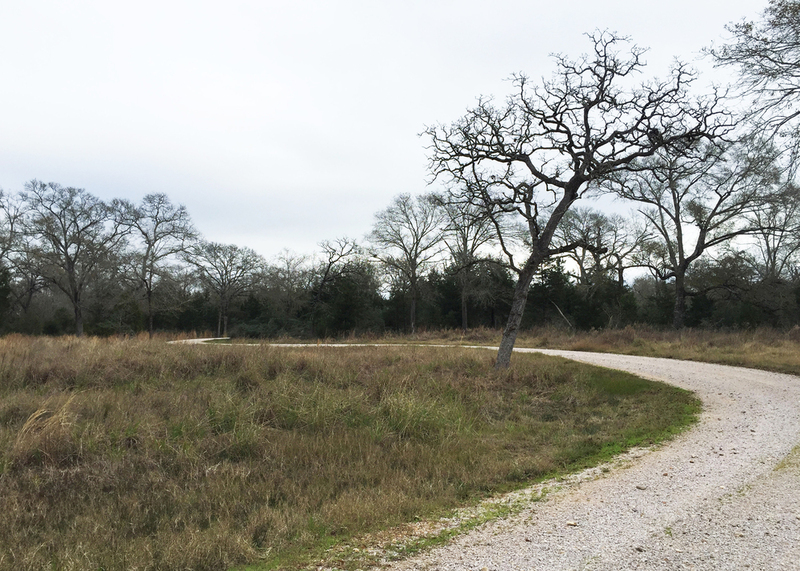 During the creation of the master plan, Studio Outside collaborated onsite with the Ecosystem Design Group of Ladybird Johnson Wildflower Center and the Natural Resources Conservation Service of USDA through their Bellville Service Center. Together a plan for restoration of the prairies was developed. With the intention of developing biological and spatial complexity with a simple set of rules, a management plan was developed that proposes three basic canopy-types: grassland, savanna, and woodland. Below these three canopy types, different management practices will be applied to the ground-plane. A few acres of brush and trees were removed to begin the process of restoring the prairie condition. After clearing, the most impactful method for restoring the land would be the practice of a prescribed burn. Prescribed burns are the planned application of fire to improve habitat and plant diversity. Studio Outside and the land owner collaborated with Cat Spring Wildlife Management Association to perform a prescribed burn. 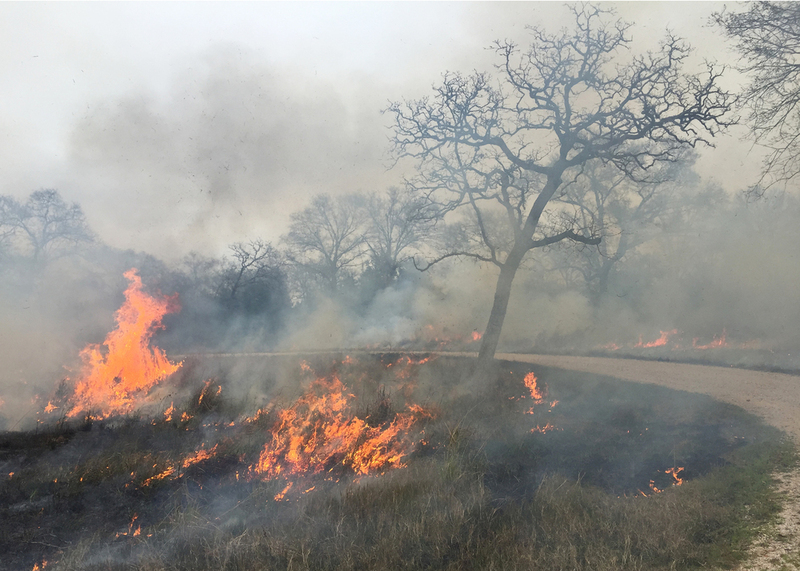 The exact timing of the burns are dependent on weather, but often occur in the winter in Austin County. In the autumn, the site was prepared by building fire roads. Vegetation was scraped to the ground to create a firebreak around the periphery of areas that were to be burned. Invasive grasses were sprayed and then shredded. In the middle of January, conditions were right for the burn. The day of the burn is dependent on weather conditions. It must be dry enough to burn, but not so dry that there is a high risk of the fire spreading. There must be enough wind to move the fire, but not enough to cause it to jump and spread. With the intense rainfall that occurred in 2015, the ground has been saturated for nearly a year. The conditions in the middle of January, 2016, were not absolutely perfect for a burn, but it seemed unlikely that there would be much drier days before the grasses would start to form new growth after their winter dormancy. On January 20th, the first prescribed burn was performed on this land. In prairie restoration, the prescribed burns are preformed about once every three years. It is this cycle of disturbances that maintain the prairie condition. With the collaboration of the land owner, Studio Outside, and local ecologists, the land will be observed over time and management will be adjusted as conditions change. 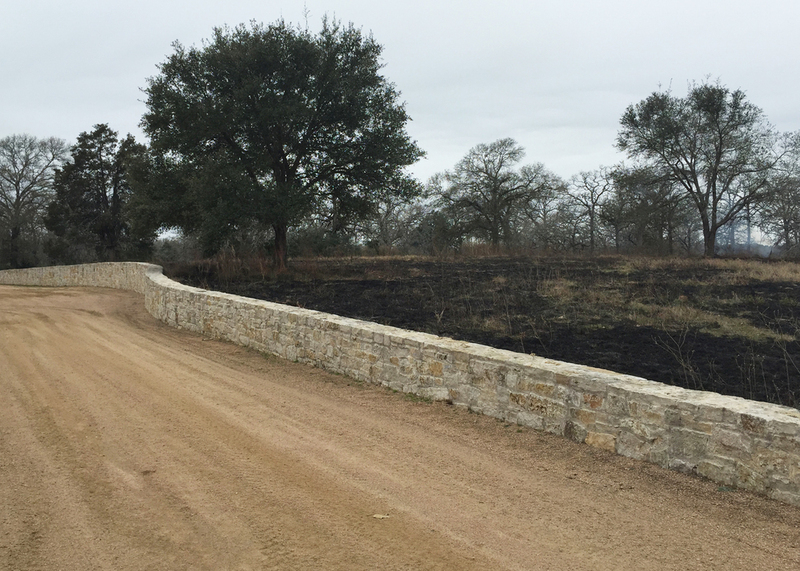 As landscape architects it is an interesting opportunity to begin to use prescribed burns as a part of the design process. Landscapes are not static, and a process of designing the landscape through management tools instead of a static plan allows for additional layers of complexity. On the day of the burn, the conditions were dramatically different before the burn, during, and after. We anticipate returning to the site and capturing photographs of the landscape as it flushes green in spring, and changes over time. But here, in this post, we present photos in an attempt to share the beauty of the day as smoke and fire changed the landscape in an effort to restore the biological complexity that the land once supported.